There are approximately 1.6 million americans diagnosed with crohn's & colitis. there is a minimum of 80,000 children as young as 6 months old, living with the disease. Click the Link for more information. 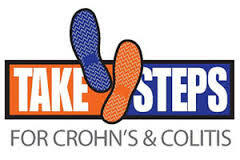 Help us "Take Steps for crohn's & Colitis"
in raising awareness and supporting those with digestive diseases. Donate a minimum of $25.00 to the Philadelphia "Take Steps for the annual Crohn's & Colitis" Walk to help find a cure for the millions of people diagnosed with digestive diseases.